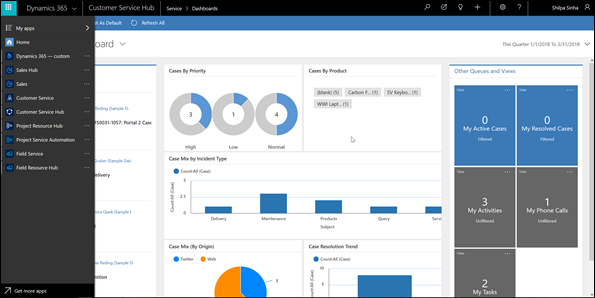 With the release of Dynamics 365 for Customer Engagement apps version 9.0, we've introduced a new user experience - Unified Interface - which uses responsive web design principles to provide an optimal viewing and interaction experience for any screen size, device, or orientation. If users work on core record types like Activities, Accounts, Contacts, Leads, Opportunities and Cases, you'll be able to move them to the Unified Interface client. 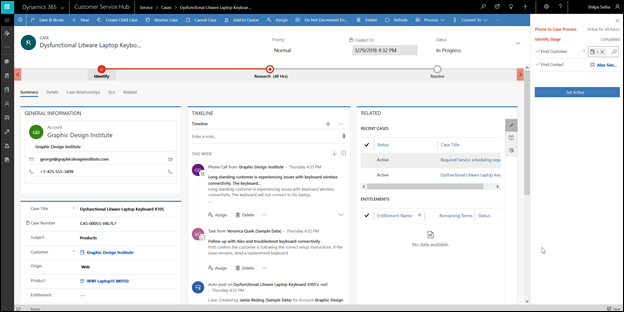 Timeline control - The timeline view helps you collaborate with your team by tracking customer communication in a record on a single page in an easy to read view. You can see everything from posts and voice attachments, to emails and notes. It provides a quick way to see the entire communication thread. Business process enhancement - The business process flow has been improved by the docking mechanism. You can dock the business process stage on your screen to help you stay focused on the task at hand in your business process flow. This is especially useful when the stage of the process has complex steps to complete. 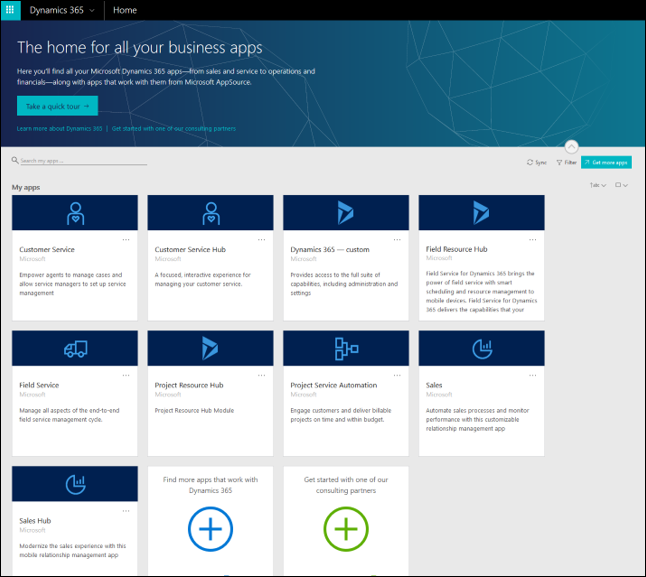 Reference panel - Use the reference panel for apps built on Unified Interface like Dynamics 365 for Customer Engagement apps for Customer Service. The reference panel is a great way to get work done without clicking away from the screen you are on. You can look up other things like knowledge base articles within the context of the record you are viewing. Navigation - The new menu options let you swiftly navigate the different apps in the system. It provides quick access to recently viewed records and pinned favorites. Reflow - The app also scales by reflowing the components on the screen. The responsive design adapts to your environment based on screen size, so the more available space that you have the more information can be displayed. Unified interface is a metadata driven experience. All controls experiences are built on the control framework that is extensible and provides a uniform experience across clients. The app display reflows to the viewport size the user is working in. Dynamics 365 for Marketing always uses the Unified Interface and is provisioned separately. 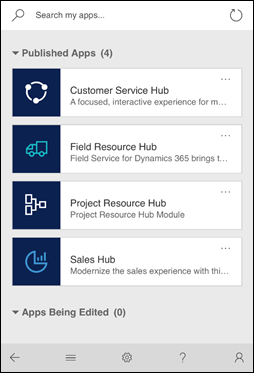 Unified interface apps are the only apps supported on phones and tablets for Dynamics 365 for Customer Engagement, version 9.0. When a user logs into the above org, they will only see the Unified Interface apps on their apps landing page. 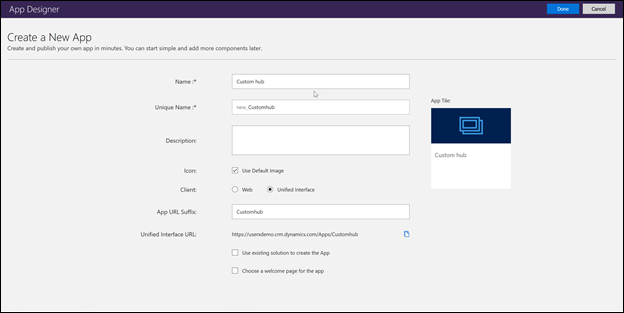 In case you have requirements to create your own experience on Unified Interface, you can create a model-driven app using the app designer. 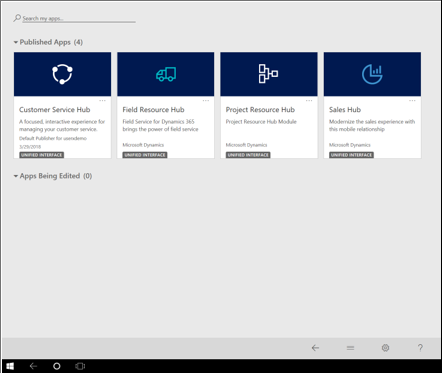 See Overview of building model-driven apps. We released some capabilities of the legacy web client in the Unified Interface that are available in the hybrid experience. You can enable the hybrid experience to get them in the browser client. There are certain entities that are currently read-only on Unified Interface. Users will not be able to make changes to these entity records within an Unified Interface app. We are working to make them editable in future releases. Some entities are being deprecated. Check out Important changes (deprecations) coming.